Experiences of a Chess Parent! Room full of chess players – most of whom are over 60! Yup, it’s another round of weekend slow-play adult chess again. Not for me, thankfully (I barely know how to set up a chess board, let alone attempt the game! ), but for my little 10 year old chess enthusiast! How did this all start? I often wonder that myself! There is one person that comes to mind though, the man responsible for spreading his love of chess to all in our household, turning not just 1 but all 3 of our boys into avid chess nutters! Tony Niccoli – or to go by his official name, Tony the Magnificent!! The man is a chess genius, responsible for so many successful young chess players, not to mention being a phenomenal chess player himself. It was entirely thanks to Tony that we even started trying our luck at junior chess tournaments. The more our eldest son got hooked on the game, the more tournaments we went to. Oh the joys of spending hours waiting in between chess rounds! But it’s all worth it if your child enjoys the game and the experience. Our boys have all gotten to know other kids that also regularly come to tournaments. Friendships are formed – both kids and parents alike. I’ve made some great friends along the way, who make the long days spent waiting in a cramped room much more bearable. The kids play football or cards in between rounds of chess, so in many ways it’s a really healthy way for them to spend their weekends. However, after having spent a good couple of years going to any (and almost every!) junior chess competition all over the country – often to the oddest places – Tony told us it was time to graduate up to slow play adult chess. So here we are, two years later, trying to take on the adult chess world. Our son spends several evenings a week and many weekends playing against mostly old(ish!) adults. 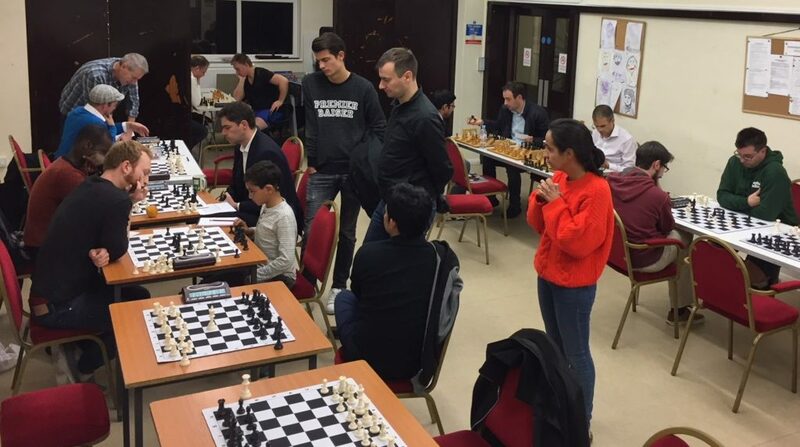 I must admit, it’s a refreshing change from the junior circuit where our kids have enjoyed meeting other young chess players, but also where rivalries can take over and sometimes over-zealous parents can get out of control! 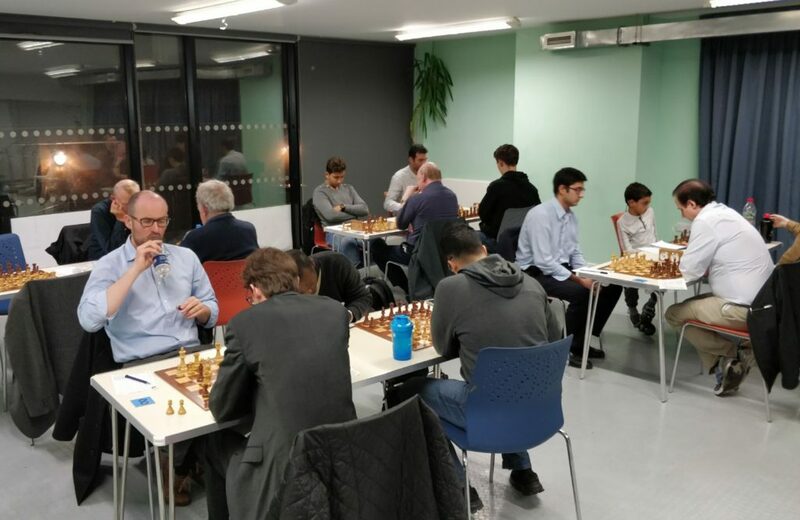 The adult chess leagues also offer brilliant opportunities for juniors to play longer games, usually at a slower rate of play – all good things for kids who tend to play too fast, and therefore blunder much more often. It also means less pressure – these juniors are playing opponents who they don’t know, most of whom are much older & more experienced, so the pressure of having to win or risk losing face isn’t on them. Adults are usually relatively friendly to the youngsters, and although they never enjoy losing to anyone – especially juniors! – when they do end up conceding defeat they’re usually mature and sportsman like about it… most of the time! You might get the odd grump every now and then who throws a tantrum to rival most 8 year olds, but that’s very much the exception! And lastly, at the risk of sounding a bit cheesy, if you’re lucky enough to find a really lovely club that’s willing to welcome your child into the fold (thanks again, Hammersmith!) then it can make for a very enjoyable and productive chess experience. In fact it seems that the most eager chess juniors all seem to be playing a lot on the adult chess circuit, more so than the junior one. After all, it has so many merits that the junior competitions can’t offer – slow play chess always makes for more interesting games, as well as a great game experience and brilliant chess practice. Being able to come to weekly training sessions is always helpful too. And even seemingly small things, like being the littlest guy in the room that everyone’s so nice and welcoming to, is a wonderful thing and makes us feel very lucky that our son is part of such a great club. He’s had some incredibly lucky wins, and some painful losses, but being a part of a supportive and encouraging chess club has been brilliant for his chess, his confidence and his resilience. Something you need a lot of if you’re going to play competitive chess! Our thanks to Suha for sharing her experience of 10yr old Nadhmi’s chess journey so far at Hammersmith! Our youngest member! Thoroughly enjoyable read, thanks for sharing! Nice article. I liked your munificent comments re the unsung heroes , the teachers, who motivate and encourage others to do better. You have a talented child, keep up your good work and who knows how far he can go. By the way I have never in my life met a grumpy old chess player, lol. Really pleased that Nadhmi is enjoying his time at the club. We’re glad to have him. A really nice insight into what it’s like for a parent. Also a helpful reminder of all the sacrifices our parents made for each of us! Most important that he still loves the game and wants to play! Long may that continue!